There is nothing more magical than the moon’s glow lighting up the sky. Now imagine that same romantic shimmering light shining throughout your yard every evening. Moonlighting acts as a natural illumination that casts a soft dreamy light over your space creating an at–home sanctuary. The calming atmosphere will turn your backyard into a peaceful escape you’ll never want to leave. The effect of any landscape lighting is absolutely captivating, and specifically with moonlighting, Conscape Lighting + Audio will enhance the overall ambiance of your home’s outdoor space. Our designers install light fixtures in the branches of strong, sturdy trees to simulate moon light filtering. This not only gives off the full–moon effect, it also becomes an enticing mood setter for having a dinner party, small gathering or simply hanging out in your backyard on a warm night. The elevated light fixtures make for a great spotlight on a walkway or pathway through your yard since they are able to shine on a larger area. Moonlighting is softer and less bright than as other landscape lighting techniques, so the low–voltage light produces a more relaxing environment. Moonlighting brings a new focus to your outdoor space and creates areas to enjoy with your family and friends. Creative lighting adds to the livable space of your property in a safe and design conscious manner. Not only is moonlighting safe and absolutely stunning, but the Uni–Ball Tree Mount product made by Coastal Source is convenient and effective. In addition to moonlighting, add more light fixtures around the premises of your yard to ensure proper safety and security all with a dramatic effect. Conscape Lighting + Audio wants your home to glisten all night long for you and your guests. 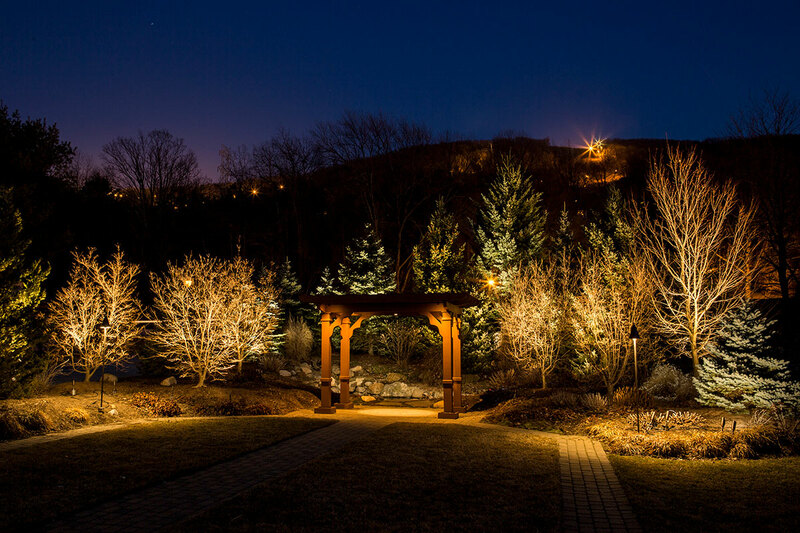 Contact Conscape Lighting + Audio today for a free consultation and to receive more information on outdoor lighting opportunities in Vaughan.